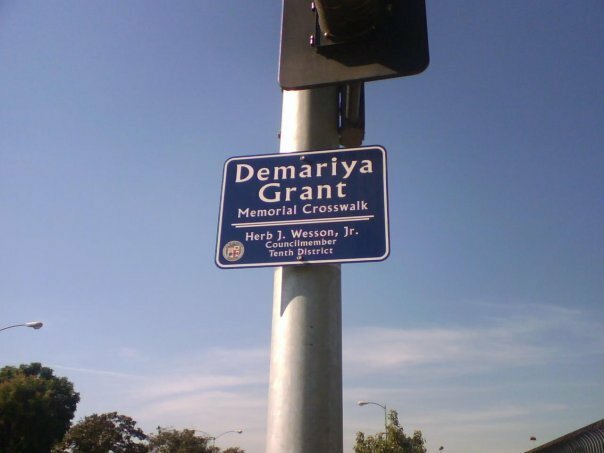 The City of Los Angeles honors civic leaders and local heroes by naming buildings in their honor, but crosswalks are reserved for the children who die trying to cross the street. This is hardly the mark of a Great City. Marvin Braude served the City of Los Angeles as a City Councilman for thirty-two years, a significant contribution that was memorialized with the Marvin Braude Bike Trail, the Marvin Braude Mulholland Gateway Park and the Marvin Braude Constituent Service Center. John Ferraro served the City of Los Angeles for five decades and his thirty-five year tenure as a City Councilman is the longest of any member. His contribution to the City of Los Angeles was memorialized when the landmark Department of Water and Power's General Office Building was renamed the John Ferraro Building. Demariya Grant was a nine-year-old who simply wanted to cross the street but was struck and killed by a hit-and-run motorist, prompting the City of Los Angeles to memorialize the incident with the "Demariya Grant Memorial Crosswalk" on Rodeo Road between Rodeo Lane and Farmdale Avenue near Dorsey High School. Jason Quarker was struck and killed while crossing Jefferson on his way to the 6th Avenue Elementary School, prompting the City of Los Angeles to memorialize his sacrifice with the "Jason Quarker Memorial Crosswalk" at 6th and Jefferson. Two weeks ago, Emely Aleman, 12, and Angela Rodriguez, 10, were struck by a motorist as they attempted to cross Laurel Canyon Boulevard, a tragedy that resulted in the death of Emely and critical injuries to Angela. The City of Los Angeles will memorialize the incident with the "expedited installation of a traffic signal" that was originally scheduled for 2012. The City acknowledges municipal liability for the streets of Los Angeles if it knows of the dangerous conditions and does nothing to mitigate them. For example, the City Attorney pays out on vehicle damages caused by potholes if the claimant shows that the city had knowledge of the pothole and failed to act in a timely manner. The "prior knowledge" and "timely manner" conditions would seem to apply comprehensively to the streets of Los Angeles citywide. It's no secret that the streets of Los Angeles are filled with fast and dangerous traffic, a simple fact that is supported by traffic statistics. The LAPD loses more police officers in vehicle crashes than to gunshots, yet the LAPD still wear bullet-proof vests instead of helmets. Emely and Angela attempted to cross Laurel Canyon Boulevard at an intersection that has a long legacy as a dangerous location. Pedestrians have been struck three times this year and a cyclist was killed last year by a hit-and-run motorist, all at Laurel Canyon Boulevard and Archwood Street. Speed limits that can't be enforced, streets that can't be crossed, and traffic signal improvements that are prioritized based on deaths are all symptoms of a systemic failure to prioritize public safety. As the NoHo community petitions City Hall for help in managing the traffic in their neighborhood, the LA Department of Transportation drifts without a General Manager. Two Assistant General Managers grapple with five divisions that operate with silo independence, resulting in budget overruns, performance failures, and anticipated funding forfeitures. LA's Department of Transportation has been taken to task for removing crosswalks in an attempt to reduce motorist/pedestrian conflict, a strategy that has been mocked as the equivalent of reducing forest fires by chopping down the trees. Critics claim that the LADOT's antiquated traffic strategies fail at every level and that the "bigger, wider, faster" strategy for moving motor vehicles has not only failed to relieve congestion but has also resulted in local neighborhood streets under siege. It's time for the City of Los Angeles to honor civic leaders who champion public safety by confronting the dangerous conditions on the streets of Los Angeles. It's time for the City of Los Angeles to honor the lost lives of the children who die on the streets by making it a priority to control the traffic that terrorizes our communities. When the Mayor gets done with the press conferences celebrating LAPD Chief Charlie Beck's 1st anniversary as LA's top cop, it is imperative that he focus on the real opportunity to make Los Angeles a safer city, one where children can safely walk to school and then return home at night to their families. That is the mark of a Great City.